Remembering Julia is an invitation to rediscover the pleasures of cooking. In 2000, Julia Child was awarded the Legion D’Honneur, France’s highest honor. This grand dame, who brought the joys of French cooking to America, received a lot of attention this year and you have to love posthumous productivity, the true sign of greatness. Here it was 2009 and “bon appétit” Julia Child (1912 -2004) was the author of the number 1 bestselling Mastering the Art of French Cooking, all seven hundred pages first published in 1961. And all it took was a movie deal. Rereading Julia’s recipes is at times opening up a time capsule. 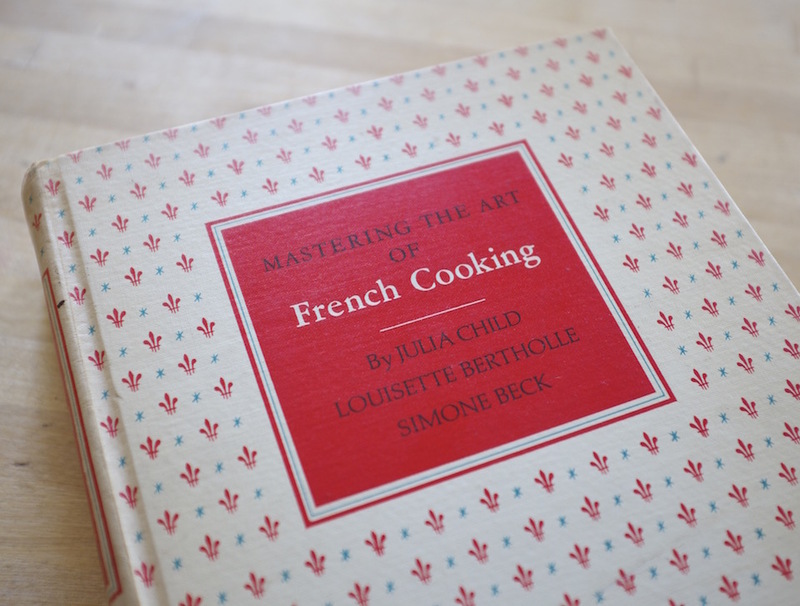 Anyone who has seen the movie Julie & Julia knows that Mastering the Art of French Cooking was undertaken to educate the “servantless” American cook on the fundamentals and classics of French cuisine of that era. That period has passed, though less radically in France where a recent survey showed that families still ate 76% of their meals made from scratch. The French still sit down and spend more time eating full meals at the table than Americans or other Europeans, but the world has evolved, our work and home lives have evolved, and the availability of food has evolved, so the way we cook and eat, at least for those who pay attention to what they put into their bodies, is different now than fifty years ago. Julia’s recipes are no longer consistent with the ways most Frenchwomen eat these days, although the French certainly eat Julia’s classic type of food occasionally but not daily or even weekly at home or at restaurants. Julia published a lot of recipes, and the quick and easy ones are alive and well, but the more elaborate ones are left for special occasions or restaurants. 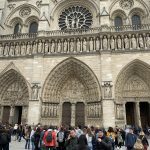 Although there are differences in France between the North (where people eat a lot of starch and fat) and the South (where olive oil and the Mediterranean style leads to a healthier lifestyle), what and when people eat is evolving from Julia’s France. The high price of butter and other ingredients certainly is shaping what people are eating (croissants are not as buttery in many bakeries), and with an aging population, mini sizes are more and more introduced, and I notice people opting for them. Young men are feverishly getting into cooking meals. Plus the government is taking action in schools so kids are getting an early education on food and eating. In general, French people still eat more fresh food, shop more frequently, and visit markets for fresh produce more than Americans, cook and eat at home much more, eat smaller portions and a wider variety of foods. The recipes in Mastering call for a lot of butter, cream, duck fat—inconsistent with the way most Americans eat these days, even those with quite a few pounds to lose and sending up warning flairs to those worried about how fattening this would be. With our sedentary 21st century lives that’s a valid concern, and we should not overdo it, but remember the French paradox: French people eat butter, cream and duck fat, and drink wine but live longer than Americans and have much lower rates of heart disease, in part because they also eat more fruit and vegetables and balance eating with walking and other movement activities like taking the stairs. Another striking contrast in the way the French eat versus Americans is in portion size, which is considerably smaller. The French simply eat much less. So in that overall context what’s the problem with a little flavorful butter and cream in a dish accompanied by a “medicinal” glass of red wine? Just don’t double up on portions. And Julia’s mid-20th century recipes, made from scratch from fresh ingredients surely are far more nutritious than the 21st century “fat” version, including artificial trans fats we have come to associate with fast-food meals and take out—two staples of many Americans’ diets that are also generally extremely high in salt and/or sugar (which make one eat more) and have other ingredients (like corn syrup and chemicals) that are far from natural and/or good for us. Not that France or Europe is immune from processed or fast foods. They are a symbol of globalization. Reading or rereading Mastering the Art of French Cooking in 2016 might be more an armchair than kitchen exercise, but it is an invitation to revisit what we put into our bodies and to eat healthy. For me it is also a reminder of eating for pleasure and the hearty appetite Julia brought to the table. I enjoyed the film Julie & Julia, but I got stuck on Meryl Streep’s performance, always conscious that I was watching a grand performance by an impersonator rather than absorbing the true character. In any case, Julia’s joy and love of food and eating (dining is not the right phrase for her) was a phenomenon hard to capture on film. I knew her a bit and we were sometime co-conspirators over a meal, a bottle, a table. Back in 2001 just before she was scheduled to leave her home in Cambridge, MA, for an assisted-living facility in California, I hosted a going away La Grande Dame dinner for 50 of her women friends in the Boston area (mostly chefs, sommeliers, caterers, press, and publicity ladies) at No. 9 Park where Chef Barbara Lynch prepared a magnificent dinner. We almost cancelled the event, which was scheduled for the week after the 9/11 tragedy, but Julia would have none of that. And at that dinner, I was amazed and pleased to see octogenarian Julia’s appetite (for food, wine and life) over a five-hour meal…the French way to the end. French women don’t have much TV to watch. Follow Mireille on Instagram for the latest updates in the French woman lifestyle! Sign up for the newsletter to receive news, special features and more. Looking for Mireille Guiliano's author page?